Keep an eye out for the Youth and Adult Pathways (YAP) Event Series, a new microgroup series within the Career Pathways community on the LINCS platform. The YAP Event Series is designed to bring together professionals with a shared interest in connecting youth and adult learners with career pathways. Presenters are experts in their fields, and events are designed to enhance your knowledge and give you usable information in each area. 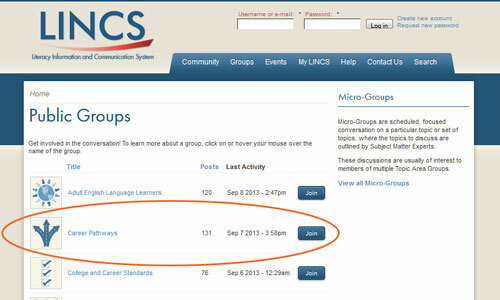 Centered around a live webinar with an established expert, each topic in the series is presented as a month-long “microgroup” within the LINCS Career Pathways community and will include ongoing engagement and discussion before and after the live events. If you miss one of the live webinars, all materials and webinar recordings will be available for download. 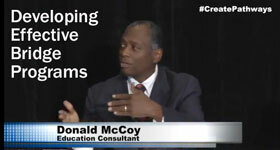 Priority access to information about U.S. Department of Education initiatives. Have fun and enjoy all that the new community has to offer. local, regional, and state level program staff. If you have any questions about ACP-SC's transition to LINCS, please contact Tanya Shuy at Tanya.Shuy@ed.gov. OECD's recent survey on adult competencies, PIAAC, will benchmark how effectively education and training systems meet emerging skill demands. Over the past three years, ACP News has highlighted states and programs that are demonstrating promising practices to provide readers with useful insights into the ongoing development and implementation of successful adult career pathways systems. This final issue of ACP News highlights career pathways initiatives in nine states showcased in previous issues. To help adult basic education (ABE) students advance to certificate and degree completion, Shoreline’s Computer Numerical Control (CNC) Machinist Program was built on the I-BEST (Integrated Basic Education and Skills Training) model. The I-BEST model pairs workforce training and ABE or English as second language (ESL) education, allowing students to learn literacy and workplace skills simultaneously. The CNC program is benefitting from the rebirth of Shoreline’s manufacturing program four years ago. Find out more about Shoreline’s program in ACP News Volume 1: Issue 2. Florida Department of Education Chancellor Loretta Costin and State Program Director Zelda Rogers worked closely with a small group of adult education deans and directors to appropriate more than $7 million in competitive grant funds and provided a state-wide strategic plan to upgrade programs so that they could join the emerging Adult Education Career Pathways movement. Prior to making grant funds available, Chancellor Costin commissioned a series of professional development trainings on career pathways. The trainings were held throughout the state and allowed interested parties to not only learn more about career pathways, but also to interact with presenters and ask questions relevant to their own programs. Since the trainings, Florida teams have been actively working to support adult education by contextualizing curriculum and repurposing programs. Learn more about Florida’s progress implementing career pathways in ACP News Volume 1: Issue 2. Oregon’s Department of Community Colleges and Workforce Development (CCWD) is partnered with community college Adult Basic Skills (ABS) programs on the Oregon Pathways for Adult Basic Skills Transition to Education and Work (OPABS) Initiative to accelerate the process of building a pipeline of ABS learners who are prepared to enter postsecondary education, training programs, and jobs in high-demand career areas. OPABS takes the primary focus away from simply passing the General Educational Development (GED®) test and instead emphasizes the application of critical skills to further education and employment. While OPABS does assist students in achieving short-term goals such as passing the GED®, completing the National Career Readiness Certificate, preparing to enter credit-level courses, and developing job search materials, the model also supports long-term goals such as completing a college certificate and/or degree and solidifying employment in their chosen industry. Read more about the OPABS Initiative in ACP News Volume 1: Issue 3. Adult education programs serve a wide range of students, including out-of-school youth who seek pathways back to the educational system. The Colorado Success UNlimited Initiative (CO SUN) was designed to identify and enhance innovative practices from Colorado’s Adult Education and Family Literacy program and extend them to other adult education centers across the state. The project was commissioned by the Colorado Community College System Foundation, and it aligned with other initiatives of the Governor’s P-20 Education Coordinating Council, the Colorado Adult Education and Family Literacy Act, Title II of the Workforce Investment Act, and other state agencies. The overarching goal of CO SUN was to create innovative transition programs and practices to promote the successful transition of out-of-school youth to community colleges. Read about CO SUN’s results from this program in ACP News Volume 1: Issue 4. Minnesota's FastTRAC (Training, Resources, and Credentialing) Adult Career Pathways program is transforming the lives of educationally underprepared adults. FastTRAC is a statewide partnership of ABE workforce development and the Minnesota State Colleges and Universities (MnSCU) systems, including non-profits and human services. It is focused on improving outcomes for low-wage, lower-skilled adults through a career pathways approach that integrates basic skills education and career specific training. Minnesota’s statewide vision is that every two-year MnSCU institution will have one or more FastTRAC Adult Career Pathways programs leading to certification in high-growth, high-demand occupations. Read about what FastTRAC has to offer in ACP News Volume 2: Issue 3. Adults in Montana seeking to begin a new career pathway have a powerful set of tools available to help them navigate their journey. In 2008, using funds from a WIA Incentive Grant, three Montana state agencies partnered to develop a statewide resource that could support all adult learners, no matter what their point of entry might be. The new system was named “PEP Talk” for Personalized Employment Plan. PEP Talk allowed the state to leverage an existing valuable resource that had been underutilized, the Montana Career Information System (MCIS). PEP Talk was designed to guide individuals through each step of the career planning process using robust tools already available within MCIS. Find out why PEP Talk works in ACP News Volume 2: Issue 4. The evolution of career pathways has been a journey in systemic change for educators and workforce development professionals in Kansas. Fast forward to the present and you will find nine Kansas community and technical colleges engaged in Accelerating Opportunity: Kansas (AO-K). AO-K is a groundbreaking demonstration project that is transforming the state’s delivery system for adult education. AO-K uses an integrated education and training career pathways model to deliver career and technical education with adult basic skills instruction, keying off the successful I-BEST model. Students complete short-term certificate programs aligned with labor market needs, leading to industry endorsed credentials and immediate jobs. Read about examples of these programs in ACP News Volume 2: Issue 5. Career pathways initiatives supporting both youth and adults can be found across Virginia. In 2008, Virginia released Bridging Business and Education for the 21st Century Workforce, a report that accelerated career pathways activities already underway in the Commonwealth. A multi-agency work group brought together representatives from a host of state agencies to envision and commit to developing a statewide system that offered flexibility to meet regional workforce demands. 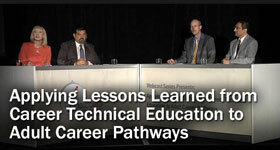 Since that time, numerous career pathways initiatives have emerged to serve target populations. The career pathways system has become the principal model for workforce development in Virginia, bringing together nine state agencies with responsibilities for administering federal and state-funded career and technical education and workforce development programs. Read about adult education career pathways programs that are making a difference in Virginia in ACP News Volume 2: Issue 6. Pennsylvania is a diverse state with great variances in the types of employers. As a result the state designed the Career Pathways for Adults initiative to build on strong relationships among state agencies and the vision of a group of adult education leaders to develop a career pathways model that provides both structure and local flexibility. The initiative also leverages significant work by local adult education agencies in building and maintaining partnerships with employers, postsecondary providers, and community-based organizations. In addition to a state planning guide for career pathways, individual Career Pathways for Adults guides were developed by Pennsylvania State University’s Institute for the Study of Adult Literacy for each local workforce investment area participating in the project. See what these guides provide programs with in ACP News Volume 3: Issue 1. 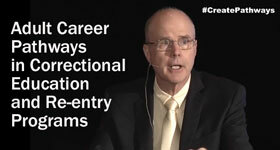 One could easily describe Wisconsin as an early adopter of career pathways. Their journey has been marked by milestones, each helping to shape the state’s approach to workforce development. Much of Wisconsin’s earliest career pathways efforts were supported by funding from the Joyce Foundation’s Shifting Gears initiative. Wisconsin’s involvement in Shifting Gears led to the development of the Regional Industry Skills Education project, known as RISE. The program engaged stakeholders in state-level policy change and regional program innovation with the goal of creating adult career pathways programs that offer workers stepping stones to skills and credentials that Wisconsin’s growth industries demand. Learn more about how Wisconsin is raising the bar for career pathways in ACP News Volume 3: Issue 4. In July 2010, Louisiana legislators approved a governance change for adult education, a move that state leaders hoped would better align adult education and workforce development. The move was designed to combine the strengths of existing adult education providers and the Louisiana Community and Technical College System to deliver work-readiness and employment results to adults who want and need a better path to a sustainable livelihood. To accomplish these work-focused goals, and meet traditional adult education goals of literacy and high school equivalency diplomas, a new model for the delivery of adult education services was born, WorkReady U. To deliver its services, WorkReady U leverages the experience of a diverse network of local providers including Local Education Agencies (LEAs), community-based organizations, faith-based organizations, community colleges, and correctional facilities. Find out what the WorkReady U provider network of 34 programs that operate more than 200 adult education instructional sites throughout Louisiana provides in ACP News Volume 3: Issue 5. The DICP initiative has continuously provided widely accessible resources that support states and local programs on the path to constructing high-quality adult career pathways programs. The project’s commitment to support the field in their career pathways efforts led to the creation of numerous resources that address key issues, provide promising practices, and offer professional development opportunities. This section highlights a few of these resources from the past three years. Building Strategic Partnerships is intended for adult education program administrators interested in building new and strengthening existing partnerships essential for successful development and implementation of adult career pathways programs and systems. Developing Effective Bridge Programs can help you develop and implement effective adult career pathways bridge programs designed to help your adult learners master the basic skills they need to advance to the next level of education, training, or entry-level employment in career fields that are in local or regional demand. Designing Contextualized Instruction helps teachers understand contextualized instruction and its supporting research base and discover how to use the contextual model of instruction to develop adult career pathways courses, and how to identify and overcome common challenges in developing contextualized instruction. Integrating Career Counseling and Planning into Adult Education is intended for adult educators, administrators, coaches, case managers, transition specialists, career counselors and others working with adult learners seeking to transition to the next step along a career pathway. Engaging Employers in Adult Career Pathways helps adult education instructors and program administrators understand how to identify, engage, and sustain engagement of appropriate employers in the development of career pathways programs. Employer engagement in adult career pathways programs can strengthen the efforts of adult educators to help learners attain secondary credentials, transition to postsecondary programs, achieve industry credentials, and secure family-sustaining employment. To assist programs, the ACP-SC team convened a team of subject matter experts to author an issue brief that focused on engaging employers. Read the Engaging Employers to Support Adult Career Pathways Programs Issue Brief. 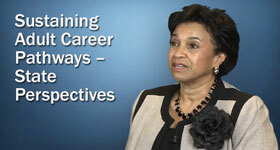 Continue Your Professional Development and Join the Career Pathways Group on LINCS! Disclaimer: The Adult Career Pathways (ACP) News is a publication of the Designing Instruction for Career Pathways (DICP) initiative and was produced by Kratos Learning, in partnership with the Center for Occupational Research and Development, with funding from the U.S. Department of Education (ED), Office of Vocational and Adult Education (OVAE), under Contract No. ED-CFO-10-A-0072/0001. The opinions expressed herein do not necessarily represent the positions or policies of the U.S. Department of Education, and no official endorsement by the U.S. Department of Education should be inferred. This document is in the public domain and may be reproduced without permission.